This guide details how to build a simple energy monitor on a breadboard that can be used to measure how much electrical energy you use in your home. It measures current, but uses an assumed fixed value for voltage (230V, if you're in the UK) and calculates apparent power. Although not as accurate as a monitor that measures voltage as well as current, it is a method commonly used in commercially available whole house energy monitors for reasons of simplicity and cost. A breadboard and some single core wire. 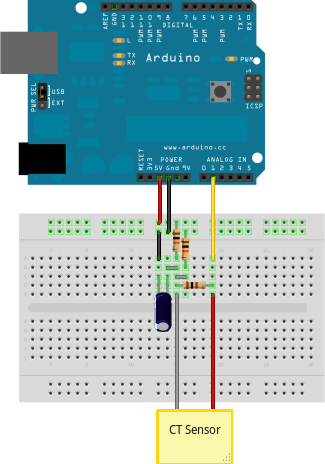 The monitor consists of the current sensor (which produces a signal proportional to the mains current) and the sensor electronics that convert the signal into a form the Arduino can use. Assemble the components per the diagram above. The sketch is the software that runs on the Arduino. The Arduino converts the raw data from its analog input into human readable values, then sends them to the serial port monitor. a) Download EmonLib from github and place it in your Arduino libraries folder. emon1.current(1, 111.1);             // Current: input pin, calibration. You should now see two columns of values. Apparent power on the left, RMS current on the right. EmonTx Arduino Shield: Our open-hardware energy monitoring Arduino compatible shield featuring the above circuit alongside voltage measurement for real power calculation.